Scopri tre delle meraviglie classificate dall'UNESCO in Inghilterra in questo tour di un'intera giornata da Londra. 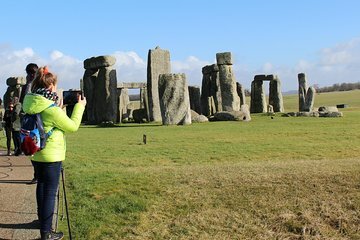 Rimanete in soggezione davanti alle pietre preistoriche di Stonehenge, ammirate la cerchia di pietre neolitiche di Avebury, fate una passeggiata nel centro storico di Bath e visitate il Lacock Village, dove hanno girato Harry Potter e Downton Abbey. Goditi un'esperienza più personale in questo tour di piccoli gruppi di solo 16 persone. Il trasporto di andata e ritorno è incluso. Il prezzo accessibile di questo tour rende la visita di tre dei siti classificati come patrimonio dell'umanità dall'UNESCO. Good day seeing the sights in England, away from London proper. Guide did a great job. I need at least 100 characters so am adding another sentence. This tour was a great experience. We saw and did so much, but did not feel particularly rushed. Rob was a very knowledgeable and personal guide and a great driver; highest kudos to him! The bus was very comfortable with great sightlines. It was a day full of fun, learning, adventure and beautiful scenery! I highly recommend this experience! This trip was so fun and informative. Paul, the tour guide, was so nice and knew so much about the areas. I took my six year old with me and we both had a great time. The price for this tour was a steal and the van that transported us was equipped with WiFi, water, and reclining chairs. I highly recommend this tour for anyone. Our guide was Scott. He was very engaging and informative. We really got to see a great deal in such a short time. The van was new and very nice. Don’t take the time to sit and eat while in Bath. At the end of the tour pick up a quick bite and eat on the van. You only have 2 hours of free time. See as much as you can! Scott was absolutely hands down the best driver/host we could have had. I apologize for not reviewing sooner but each time I saw the email for a review I recalled one of the BEST days of our vacation in London and the English countryside. Our small bus was in top notch condition for enjoying the ride and scenery but Scott, our driver, was the key that made our day memorable. If I could I would ask for him again when we return to England on another vacation. He could take ittle glitches - such as a church not being available - and would adapt quickly and turn the stop into a lovely experience. His attitude and attention to our enjoyment was better than I ever expected. Bravo Viator for employing such knowledgeable tour drivers such as Scott. He is THE best. So pleased with this tour and Paul, our wonderful guide. Our small Mercedes van took six of us into towns and villages that a large coach couldn't manage. Paul was knowledgeable and attentive to our every need. He gave us many practical tips on how to make the most of our day. Highly recommended! Took this tour during our visit to London last week. Our guide Steve was absolutely amazing!! Very knowledgeable of every site we visited and we had great conversations on our drive to each site. I would highly recommend this tour and Steve. The sites are truly breathing. Thank you Steve for making my husbands and I’s trip even more memorable. I very much enjoyed my day visiting Stonehenge, Bath, Lacock, and Avebury! The guide Rob was excellent and made the day fun. He was very knowledgeable and answered all of the group’s questions (with a rare Google search if needed). The pace of the day was nice for a full day tour and Rob let us have a photo stop for one of the chalk horses. We also had a bonus walk to the West Kennet Long Bartow - very interesting. I would highly recommend this tour as a great way to see four interesting Wiltshire locations in one day! I originally going to do a tour of just Stonehenge and Bath but then I saw this one. Steve was an awesome guide with lots of good information and a great personality. I chose this tour because of the size and all the sites that we were going to. There were 9 of us on the tour and we got to see different back road and additional towns then the big tour buses. I was surprised to hear that this company has only been in operation for over a year. If you are considering doing a day trip out of London choose this company! You won’t regret it!